From humble beginnings as a millwork shop in Hong Kong, Decca has evolved to become an international interior woodwork company serving residential, contract, hotel and retail markets in the U.S., Europe and Asia. Our portfolio has grown to encompass beautiful furniture and architectural fittings and fixtures for elegant homes, executive offices and the world's great hotels. Those who choose Decca share an appreciation for fine materials and workmanship, but have tastes or requirements that range from classic to contemporary, from a refined simplicity to pieces enriched with detailed carving and inlay. We proudly continue the legacy of design, craft and authentic quality that has defined Decca for forty years. 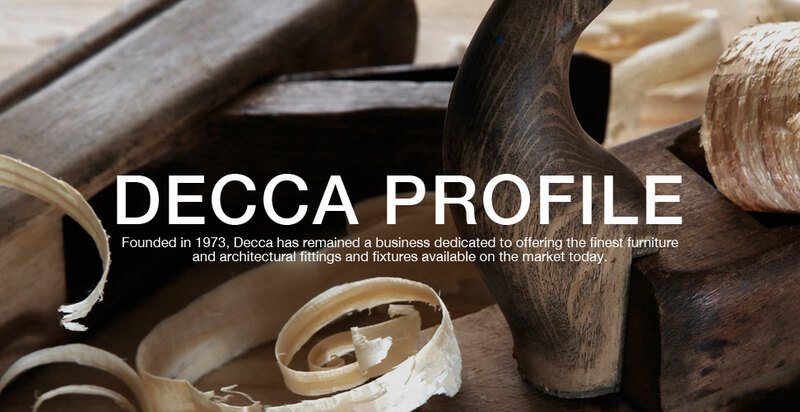 Founded in 1973, Decca has remained a business dedicated to offering the finest custom furniture and architectural fittings and fixtures available on the market today. Decca designs, builds and installs high-end bespoke wood furniture and architectural fittings and fixtures for its own brands - Decca Contract, Decca Hospitality and Bolier & Company - as well as for third-party clients. The company's manufacturing facilities are located in Dongguan, Guangdong province, China. At Decca, the concept of integrity guides everything we do, encompassing design, materials and craft. Equally, it is a principle that embraces our pursuit of efficient methods of business development on the path to sustainability. Our vision is ambitious, yet simple and genuine - to meet the most exacting standards in every aspect of our business. Decca wood products reflect our deepest values and our respect for the investment that customers make in our products. We are dedicated to creating architectural woodwork and furniture of enduring beauty and quality, products that match our customers' needs and aspirations. Through our business, design concepts become reality.